Home / Blog / Does Handwriting Matter Anymore? I think I angered a potential customer at a recent homeschool convention. She asked whether the writing for WriteAtHome courses was done on a keyboard or by hand. I told her our students used their home computer’s word processor and exchanged the papers digitally. “Because I said so.” She answered and huffed off. Perhaps she was justly offended that I would question her educational priorities. It isn’t any of my business, I suppose, but this woman’s loyalty to pen and ink baffled me. Not that she’s alone — I run into this kind of thing pretty often. Now, I don’t oppose teaching handwriting. In fact, there’s more to it than just aesthetics and nostalgia. A recent article in the Wall Street Journal points to research showing that writing by hand carries particular cognitive benefits by stimulating parts of the brain that key-clicking doesn’t. But I don’t get the feeling that brain science is behind this resistance among homeschoolers to keyboard composition. I think it’s more like resistance to science — well, technology anyway. We homeschoolers tend to be traditionalists. We teach the classics. We prefer the heft and fragrance of a hardbound volume to the convenience of e-books. And typing on a computer just seems colder and more sterile than flowing ink on creamy white paper. There’s something in us, I think, that secretly yearns for the days of quills and ink bottles. But let’s face it. Practically speaking, I can only think of one reason to concentrate on writing by hand. Can you think of even one? I’ll give you a second. Okay, time’s up. It’s the SAT essay. Standardized test essays in general, I suppose. Those are still written by hand. But aside from academia, where else in society does anyone write by hand these days? Computers are everywhere. In every occupation. Even doctors write prescriptions on tablets and smart phones these days (not that they ever seemed to care much about penmanship). Construction workers carry heavy-duty, shock-proof laptops. Don’t misunderstand. Handwriting is still valuable. Please keep teaching handwriting. But let’s face it — in the digital age, facility with a keyboard is far more practically important. A job applicant with impeccable handwriting has no advantage over one who accurately types 60 words per minute. It’s vital that students today are able to compose at the keyboard, especially once they get beyond the elementary years. Supplement with pen and paper as much as you like, but let’s not handicap our children by focusing on handwriting to the exclusion of keyboarding. When I taught cursive writing in first and second grades in a Christian school, we had students transfer into our school in third grade who claimed they could not read what was written on the board in cursive. 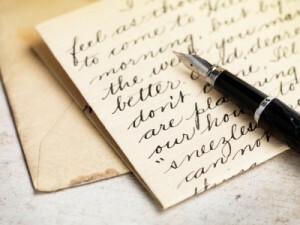 If for no other reason, I think children should learn how to write so that they can at least read letters their grandparents write or their great grandparents have written. Let us not lose the creatively (literally and figuratively) written word, but let them use keyboarding at will. My kids like WAH, if for no other reason, because they get to use the keyboard. My son has terrible handwriting, even after I stressed writing in elementary school. My daughter claims she can’t write cursive, but at least hers is legible. They rebelled from everything I wanted them to learn! But their papers for WAH are lengthier than they would be (better too, I hope!) than if I required hand-written.